Want to learn how to make your own cheese? Ok, well let’s get yer cheese on! When I was knee high to a grasshopper (I can’t believe I just used that cheesy line.. haha.. pun intended), my grandma had cows and would milk them every morning. She’d bring the steel bucket in the house, all foamy and warm from the cow, and always with a blade or two of grass floating on the bubbles. How much fresher can you get?? We had no idea how good we had it. After sieving the liquid, and separating the cream from the milk, she would replace fresh milk in the fridge with milk that was not finished from the day before. Many products came from that day old milk and cream! 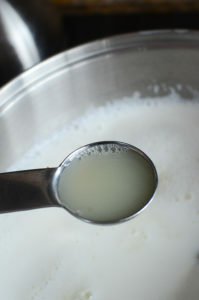 Old milk was used in puddings and making bread, the cream was used in making butter. One of the things I enjoyed the most was the home made farm cheese. Nothing fancy. No shee-shee-foo-foo “cheese cave” for that lady. Simple, easy, versatile cheese made on the farm from fresh ingredients. Believe me when I say it was SO kickbutt awesome!! Now that she’s passed on, (*snifsnif*) and that it’s now stupidly illegal to buy raw milk where I live, for me to make it, I have to improvise. So I still pay tribute to my wonderful grandmother and make my own “home made farm cheese” from time to time.. and the best part of THAT? You can too. – and a sunny outlook on life. Start with a gallon of whole milk with the highest fat content you can. Don’t squirm and get all “but the calories…”! If you’re serious about making this cheese, it HAS to be the highest fat content you can find, and even better – hell, add some left over heavy whipping cream to the mix if you have it…………. But really, hahaahhaaahahahaa! !, who has left over heavy whipping cream????? Ok, So, we need a big pot… like a soup pot. Well.. a pot big enough to fit the gallon of milk. Pour it in, and SLOWLY bring up the temperature. Don’t be in a rush, just let it do it’s thing. This might even take 15 – 20 minutes. Just keep checking the temperature. Baby it. Sing a song to it even. Put some happy vibes into the whole process. 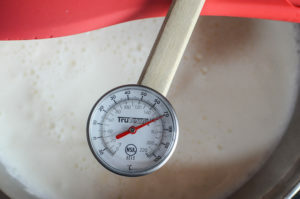 At the 160F, 165F mark, add the vinegar. Pour it in all once, give it a few swirls with your spoon and shut off the heat. Again, let it do it’s thing. 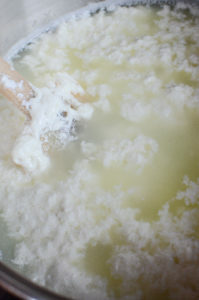 Slowly, you’ll start to see the curds separate from the whey of the milk. 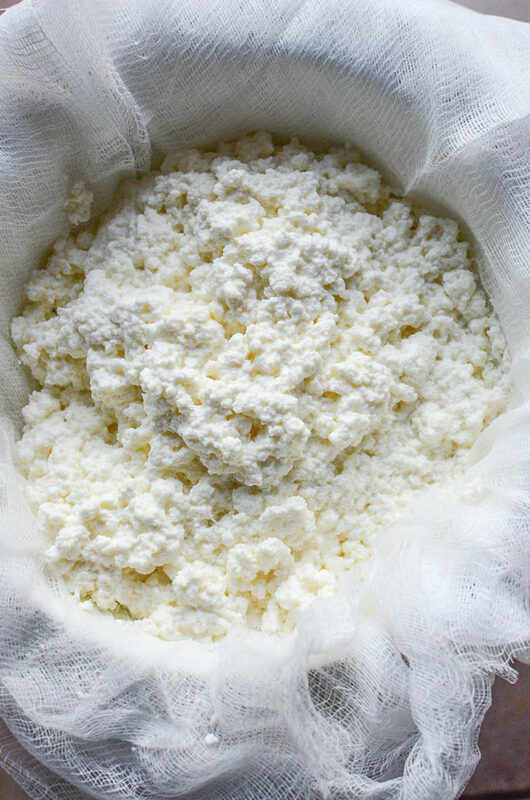 The curds are the cheese, and the whey is.. well, the whey. Leave it be for 30 minutes. For the first 15 minutes, DON’T TOUCH IT, then, occasionally go by and it give it a tiny stir. You’ll see the curds separating more. However.. don’t be a hurricane and stir it like nuts – you don’t want to break up the curds. You want them big, beautiful, cloud-like nuggets of curds. Line a colander with a couple layers of cheese cloth. Place the colander into a big bowl. I know the sprinter in you wants to just pour the whole shebang into the colander to let it drain, but don’t. Get yourself a handy ladle and put spoon the curds out into the colander. Do it nicely, like you mean it. Be it’s friends and give it some love. Spooning the curds into the colander will help to keep the shape and size of the curds without crushing them into oblivion. Now that it’s all been spooned into the cheese cloth, pick up the corners and wrap up the cheese in a bundle of sorts. Tie it in a knot, leaving long ends of the cheesecloth free. Then get your longest wooden spoon… or a yard stick… or hockey stick… or even a stick from a tree… you’re hubbies arms, whatever, use what you need to use, and wrap the ends the stick like a stork carrying a baby. Suspend the newborn bundle of cheese over the colander, so that the whey can drip from it freely into the bowl below. Leave it until it stops draining or.. you know… just go to bed and look at it in the morning. 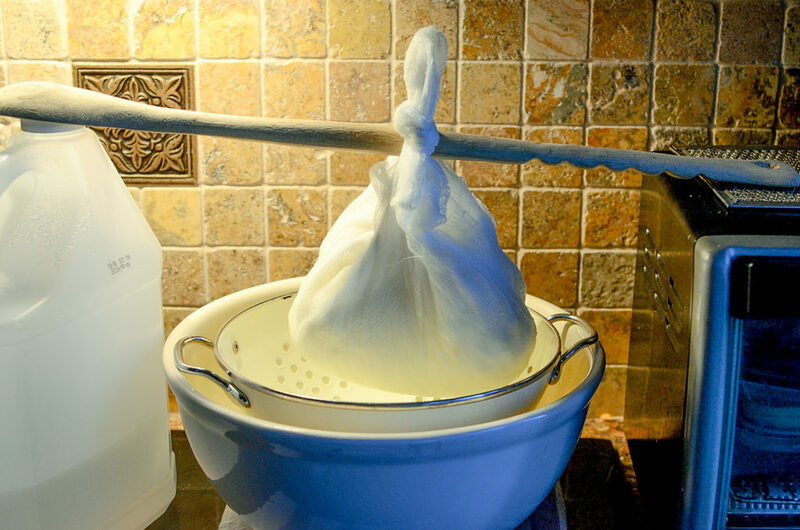 After many hours of draining, untie the cheesecloth and look inside. VOILA! You have the basics of Homemade Farm Cheese!! Yay You! So at this point, transfer the cheese into a bowl and salt it slightly. You can do SO many things with this cheese now. 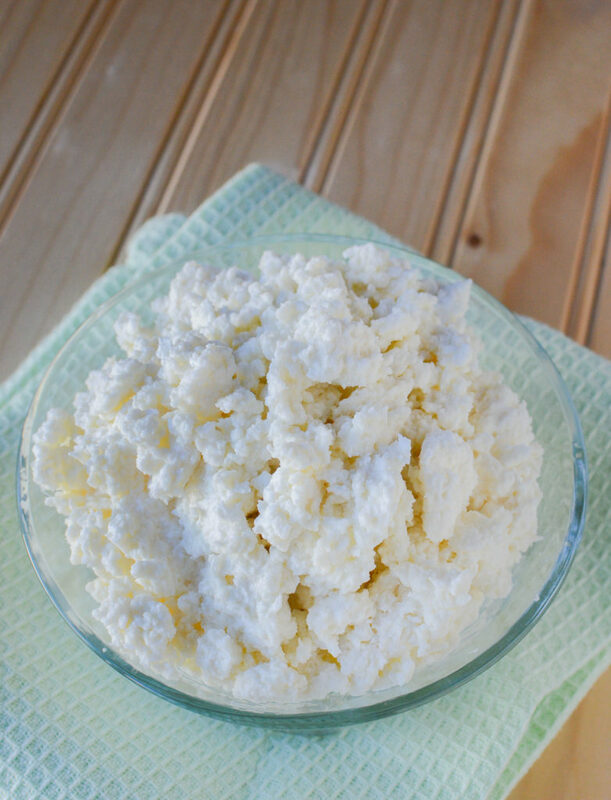 If you add some cream to the curds, you’ll have a cottage type cheese. (stir gently). 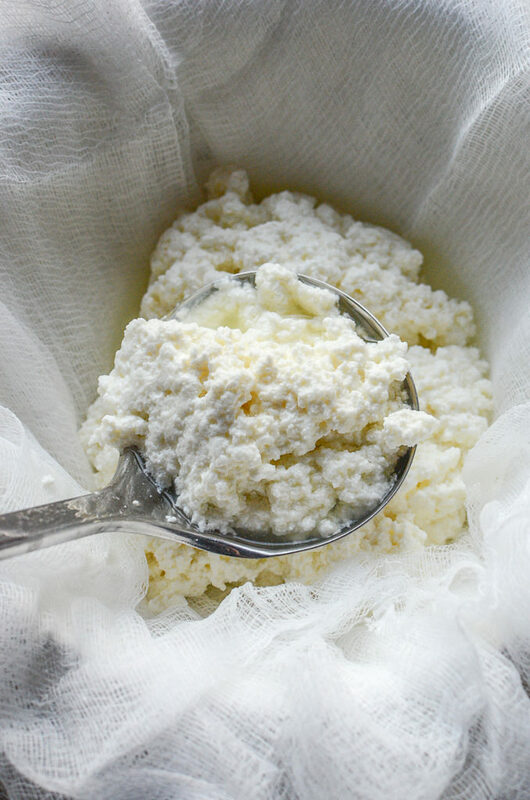 You can break up the curds in a bowl so they are finer, add just enough cream so they stick together, and now you have a ricotta-type of cheese that you can use in lasagna’s or cannolies, etc. You could leave it as is, and add a mix of herbs and spices that you like and serve it on crackers. Try using that mixture on a piece of toast with a fried egg! I just happen to have an amazing NO KNEAD bread recipe here that you could put together in snap! Also, mix in some fresh fruit and cream, and it’s an excellent breakfast! Seriously, I could go on forever here….